1988 Larson Contempra DC-300 The 1988 Larson Contempra DC-300 is a repo in fair condition. There is no canvas and the outdrives are missing. 1995 Larson Cabrio 280 The 1995 Larson Cabrio 280 is a great mid-sized cruiser with a popular floor plan to make your weekend enjoyable. The boat is driven by a 7.4L Volvo Penta engine with Gi DP outdrive. This dealer owned boat could use a good scrubbing, some canvas, and a new home, which is why this boat is value priced! Come take a look today! The vessel is in average to better overall cosmetic condition, the owner reports that all the mechanical, plumbing, entertainment and electrical systems with exception of the generator function properly. 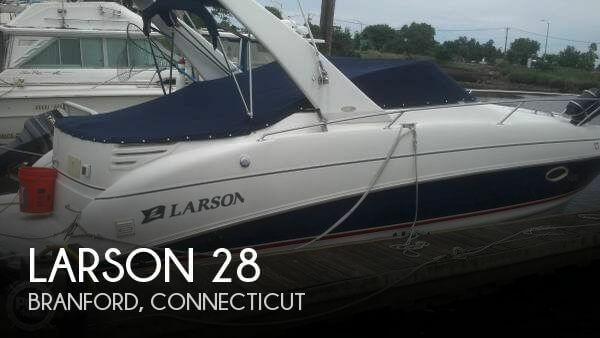 Stock #173437 2005 Larson 274 CABRIO .. looking to sell before spring launch (loaded, (generator (needs work)), camper top, bow pad...boat show special) . 1 owner, If you are in the market for an express cruiser, look no further than this 2005 Larson Cabrio 274, priced right at $25,250 (offers encouraged). This boat is located in Branford, Connecticut and is in good condition. She is also equipped with a Volvo Penta engine that has 950 hours. Reason for selling is need a bigger boat. Good condition with no tears in the cockpit seating. Seating could use some cleaning. Cockpit carpet also in good condition. Canvas Camper top in good condition with no signs of mildew or tears. The cabin is in very good condition with seating showing very little wear. 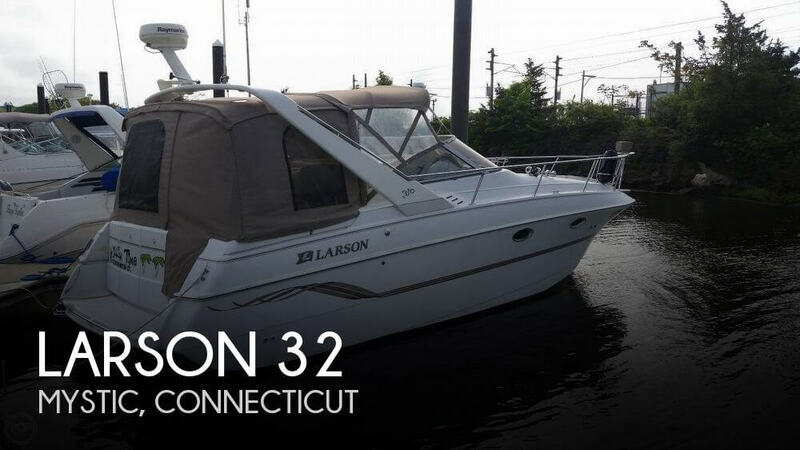 Stock #160614 Gorgeous 03 Larson 33 equipped with twin Volvo Pentas ready to go If you are in the market for an express cruiser, look no further than this 2003 Larson 330 Cabrio, just reduced to $49,500 (offers encouraged). This vessel is located in Matawan, New Jersey and is in good condition. She is also equipped with twin Volvo Penta engines that have 570 hours. Reason for selling is wants to buy a fishing boat.. This boat is a new listing, it is currently in storage. Seller will have it detailed and prepped for photos and video as soon as possible. 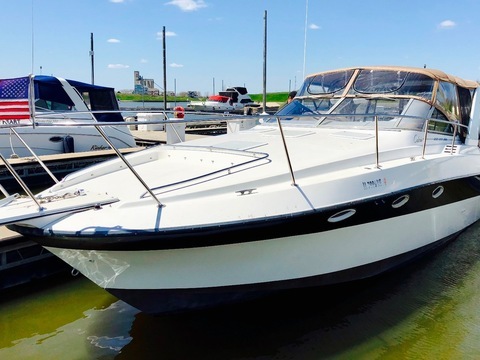 Owner has indicated the boat will be prepped and ready - April 2019 Stock #174319 Many updates including props, AC, canvas. Full electronics with radar If you are in the market for an express cruiser, look no further than this 1998 Larson Cabrio 310, priced right at $23,750 (offers encouraged). This vessel is located in Mystic, Connecticut and is in great condition. She is also equipped with twin Mercruiser engines. Reason for selling is moving up. Custom Colored Matched Shoreland'r LX 3000 single axle trailer with Swing Tongue & Chrome Wheels included Per the Seller: This boat is in excellent condition and has always been professionally maintained and Always used in fresh water Stock #134964 Excellent condition LX195s! Regularly maintained! Ready to hit the water today! 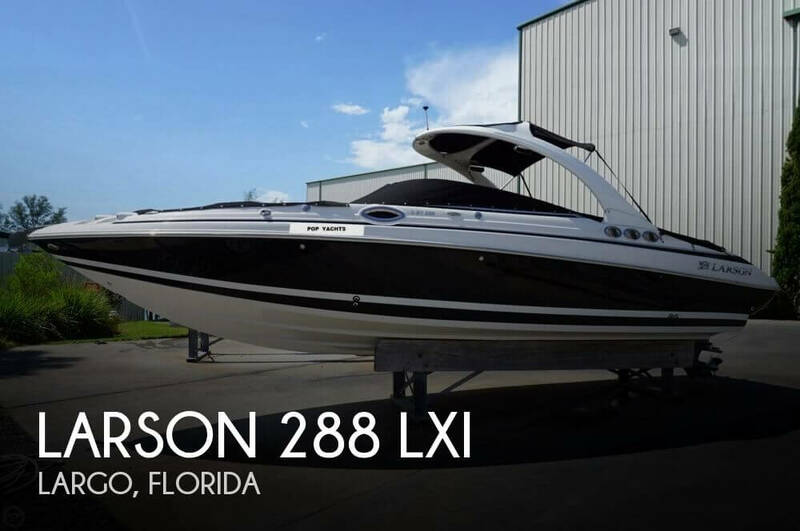 If you are in the market for a ski/wakeboard boat, look no further than this 2013 Larson LX 195S, just reduced to $16,000 (offers encouraged). 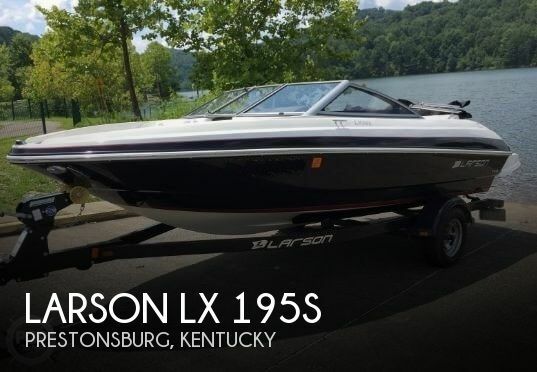 This boat is located in Prestonsburg, Kentucky and is in great condition. She is also equipped with a Mercruiser engine. Reason for selling is not using enough. Nice overall condition and stored high and dry at a marina with full cockpit covers. Slight wear on a few of the seat cushions (pictured) but nothing too bad. Gelcoat appears good overall with one small nick out of a rear corner from a possible dock bump (also pictured). Stock #107757 Speed, style and comfort! Onboard head. Nice stereo. Engine and hull in good shape. Stored high and dry under cover. Original owner always maintained. 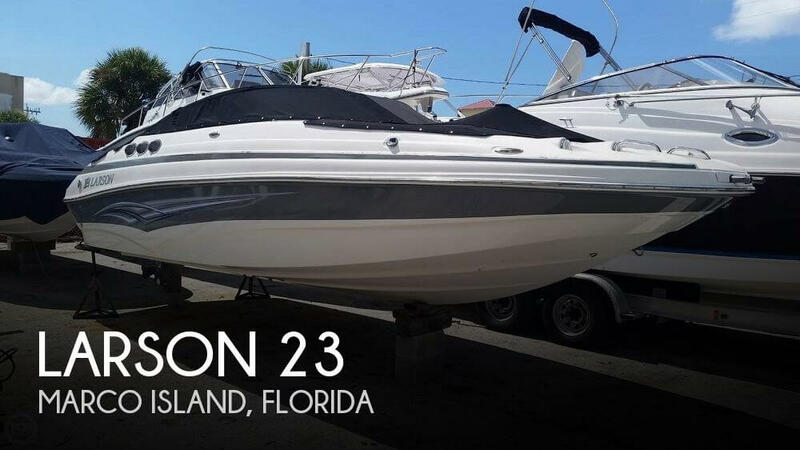 If you are in the market for a bowrider, look no further than this 2009 Larson 288 LXI, just reduced to $25,000 (offers encouraged). 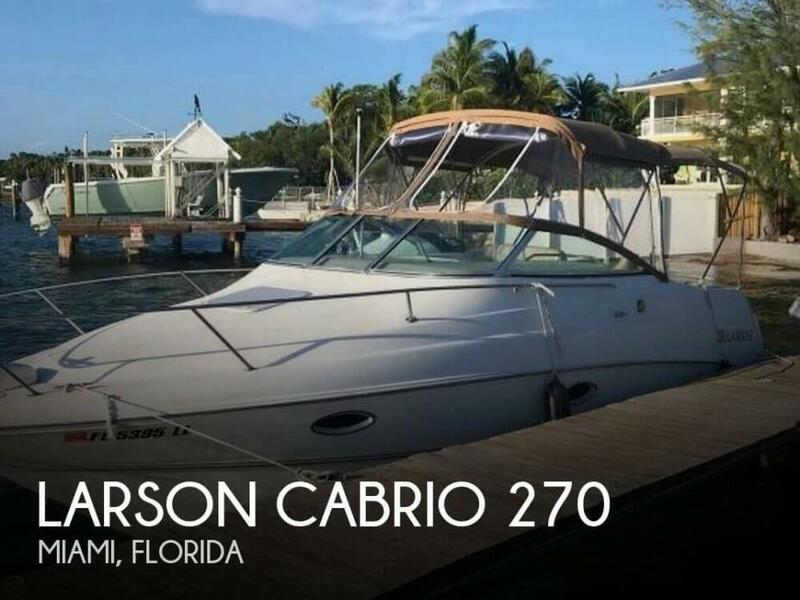 This boat is located in Largo, Florida and is in good condition. She is also equipped with a Volvo Penta engine that has 980 hours. The company offers the details of this unit in good faith but cannot guarantee or warrant the accuracy of this information nor warrant the condition of the unit. A buyer should instruct his agents, or his inspectors, to investigate such details as the buyer desires validated. This units is offered subject to prior sale, price change, or withdrawal without notice. Stock #167710 This beauty will turn some heads for sure! Grab your friends and ride some waves! 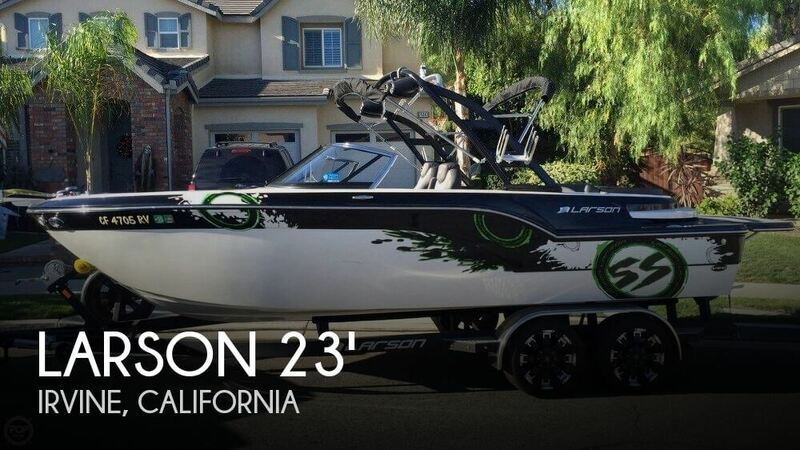 If you are in the market for a ski/wakeboard boat, look no further than this 2014 Larson 23 Super Sport, priced right at $49,999 (offers encouraged). 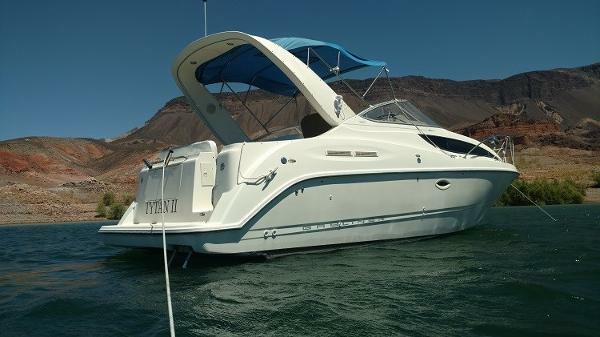 This boat is located in Irvine, California and is in great condition. She is also equipped with a Mercruiser engine that has only 97 hours. The boat appears to be in overall decent condition but will need a good detailing on the exterior and washing has low hours and is ready to go. Needs to be detailed and does have some worn cushions up top. 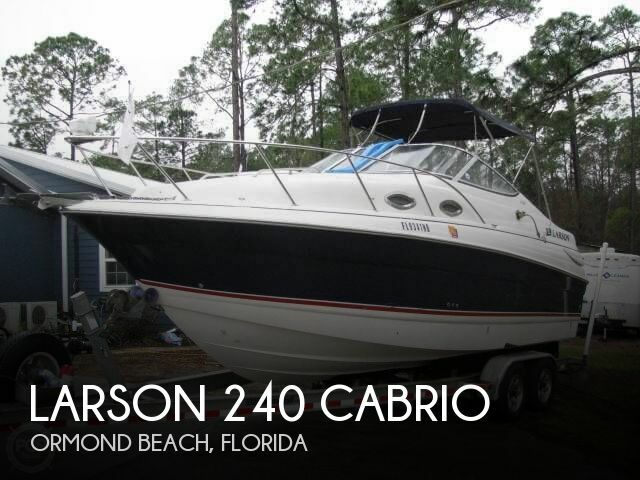 Recent service done end of 2018 : Steering cables Gimble Risers and manifolds Stock #039393 GREAT WEEKEND / LOW HOURS / MOTIVATED SELLER WANTS IT SOLD If you are in the market for an express cruiser, look no further than this 2006 Larson 240 Cabrio, just reduced to $20,995 (offers encouraged). 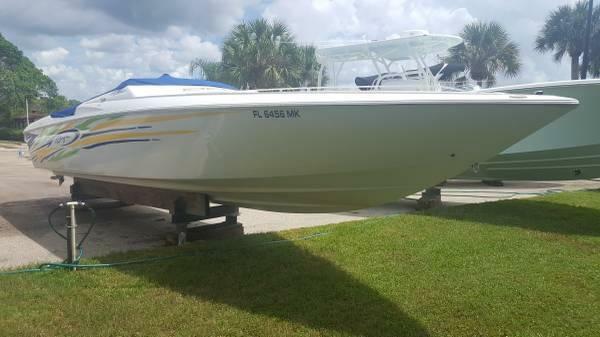 This boat is located in Daytona Beach, Florida and is in decent condition. She is also equipped with a Volvo Penta engine that has 480 hours. Reason for selling is wants a different boat. Seller states that everything is working go on the boat. The boat has been stored at home. All systems are functional. Sweet boat that will not last long! Please make an inquiry or call for more information, to set a showing or make an offer! 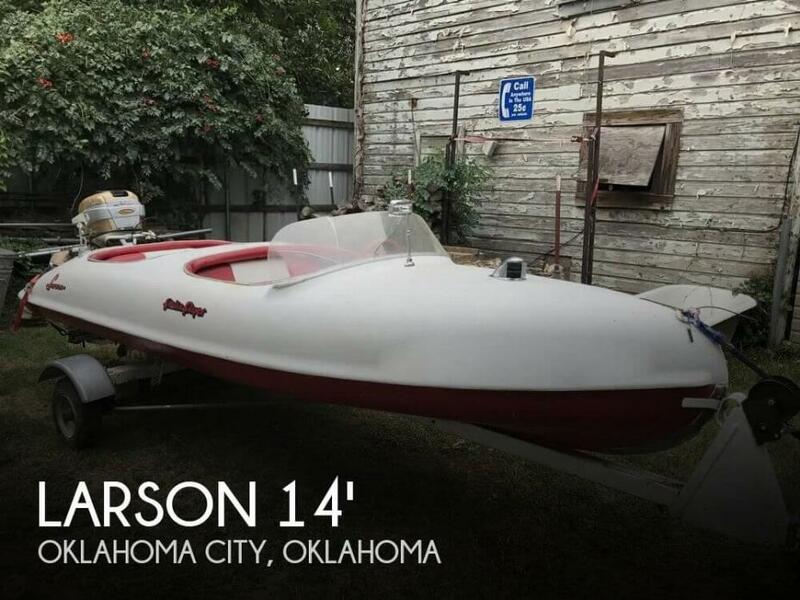 Stock #171417 2000 Larson 270 Cabrio Cruiser For Sale Reason for selling is moving up. 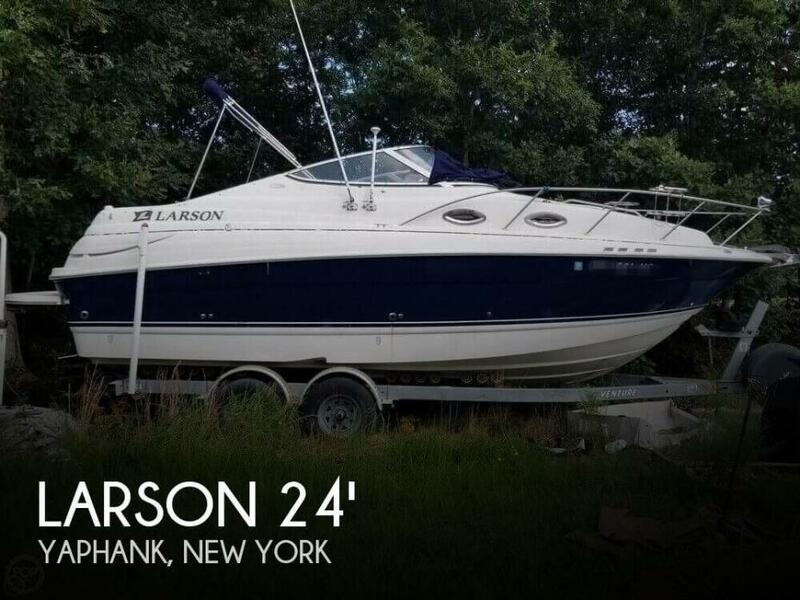 Per the Seller: All the important pieces of this Larson Lxi 270 are in good condition. The engine was flushed with fresh water after every use. The engine is professionally winterized and the boat has been shrink wrapped every season. Most of the upholstery is in good condition. The sun pad on the engine cover has a worn area and there is a small cut in the upholstery on the starboard gunwale. Stock #167675 Great high performance bow rider with a powerful Big Block 496 w/375 hp engine; gets you wjhere you need to go If you are in the market for a bowrider, look no further than this 2003 Larson 270 LXI, just reduced to $15,500 (offers encouraged). 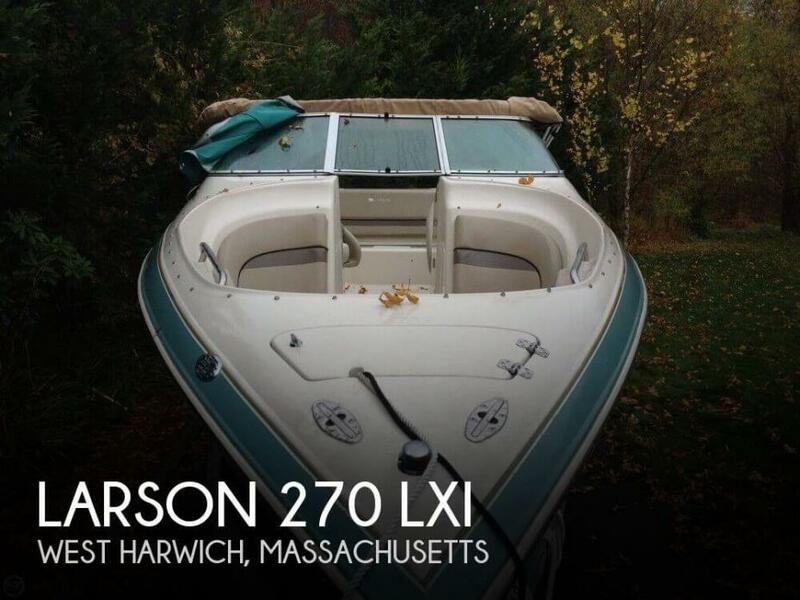 This boat is located in West Harwich, Massachusetts and is in decent condition. She is also equipped with a Mercruiser engine that has only 210 hours. Reason for selling is does not use anymore. This boat has been only gently used by its one owner with just 79 hours on the meter. She's was rack stored indoors until just the last couple of months. Even though she's now dry stored outside, she is kept fully covered. The gel coat still shines, the upholstery is in great shape, and overall the boat is clean. The only item noted that the next owner will need to address is that she needs a new set of speakers for the entertainment system. Stock #163217 Excellent condition Escape 234! Low hours! Bimini top & full covers! Seats 12! Extended Rear Swim Platform! If you are in the market for a deck boat, look no further than this 2008 Larson 234 Escape, just reduced to $20,000 (offers encouraged). This boat is located in Marco Island, Florida and is in good condition. She is also equipped with a Volvo Penta engine that has only 79 hours. Reason for selling is not using enough. Seller is the original owner. The boat has hardly been used with just 65 hours on it. ****NOTE*** This boat has not been used for the last two years and has been stored on its trailer since. Boat overall is in good condition but will need a complete cleaning and detailing prior to use. Recommended complete survey and boat trailer must be checked prior to this boat being moved to any other location The company offers the details of this vessel in good faith but cannot guarantee or warrant the accuracy of this information nor warrant the condition of the vessel. A buyer should instruct his agents, or his surveyors, to investigate such details as the buyer desires validated. This vessel is offered subject to prior sale, price change, or withdrawal without notice. Stock #160849 ONE OWNER, 65 ORIGINAL HOURS, NO BOTTOM PAINT If you are in the market for an express cruiser, look no further than this 2005 Larson 240 Cabrio Mid Cabin Cruiser, just reduced to $20,500 (offers encouraged). This boat is located in Yaphank, New York and is in decent condition. She is also equipped with a Volvo Penta engine that has only 65 hours. Reason for selling is seler has health issues.